We are excited to announce a brand new way of tracking your workouts, measuring your progress and competing with others: FITIV Points! FITIV Points are our way of solving a common problem: levelling the playing field between athletes. Athletes come in all ages, shapes and sizes. That can make it difficult to find ways of measuring progress and intensity that work for everyone. Calories, for example, can vary wildly between people. Two athletes doing the very same workout can see dramatically different calorie burns if they are different ages, genders or weights. It can be discouraging when you need to push yourself much harder for much longer to see the same numbers as someone else. It’s also hard to set goals with calories alone. 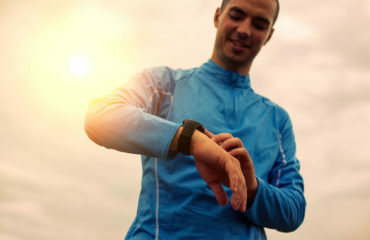 While burning an extra 500 calories per day might be a reasonable goal for one person, for another person that can require unrealistic time and intensity to accomplish. That doesn’t even take into account competition! Fitness competitions can unfairly stack the deck against people. Competition is not a great motivational tool when it’s impossible to win! That is where FITIV Points come in. FITIV Points are based on your personal intensity and workout duration. Because your intensity is calculated based on your own metrics your FITIV Points reflect your work, not your calories. As a result you get an accurate, objective score for your workout. When you have an objective score that reflects your own work you can unlock lots of goal-setting and competitive features. How do FITIV Points work? FITIV Points quantify your workout based on your personal effort. Based on the concept of MET Minutes, FITIV Points use your workout duration and effort to give you a point score. 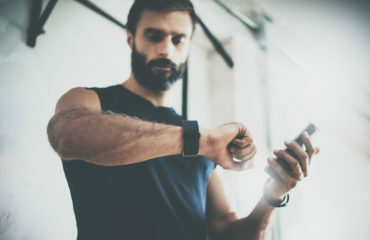 The average METs of your workouts is multiplied by the duration of your workout in minutes to give your final Points score. When you work harder and longer you will earn more points, climb higher on the leaderboards, and move toward completing your weekly goals. 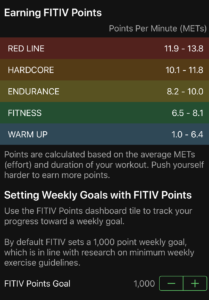 FITIV Points are automatically calculated during your FITIV workouts. 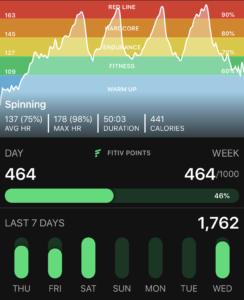 You can see your cumulative points as well as your average METs score during your workouts by setting one of the metrics on your iPhone or Apple Watch to display this data. You can also see these values listed in the workout detail view once your workout is saved. Check out the details of your workout to see both your average METs and total FITIV Points. How Can I Use FITIV Points? You can use FITIV Points in a lot of scenarios! 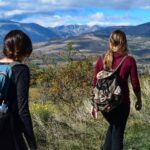 Are you looking to start a fitness challenge with friends? Because FITIV Points are only based on effort they are the fairest and easiest way to compare workouts. 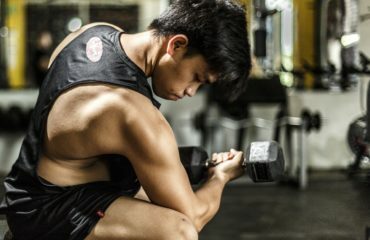 Using a custom Community workout group with FITIV makes this easy! FITIV Points are now included in every workout group’s leaderboards. All you need to do to get started is create a group, let your friends join, and start working out. FITIV Points also give you clear, understandable weekly workout goals. Check out the FITIV Points Dashboard tile to see your progress toward your weekly 1000 Points goal! No need to worry anymore about whether or not you’re exercising enough. With the FITIV Dashboard tile it’s never been easier to quantify your weekly workout progress. You can see a daily breakdown of your workout Points as well as weekly and 7-day totals. Why 1000 Points per week? We all know that we need consistent exercise to stay healthy. Doctors tend to give us abstract recommendations. We may be told that we need less high-intensity workout time or more low-intensity workout time to meet these goals. Even though we know this, it’s not always easy to understand what those recommendations mean. 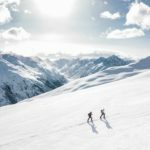 What counts as moderate intensity? 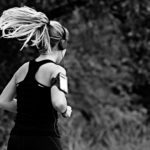 Can you mix high and moderate intensity workouts? 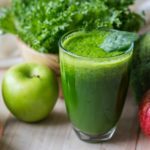 The 1000 FITIV Point weekly goal falls in line with these recommendations and takes the guesswork out of these fitness recommendations. This 1000 Points goal roughly corresponds to 75 minutes of vigorous activity or 150 minutes of moderate activity per week. Can I change my weekly FITIV Points goal? You can edit your FITIV Points weekly goal if 1000 Points per week doesn’t work for you. By tapping the FITIV Points Dashboard tile you can access details about how the Points are awarded corresponding to your heart rate zones. In this menu you can also edit your FITIV Points weekly goal! Even though 1000 Points per week is a good starting point, you may find that this is too much or not enough for your fitness level. Don’t be afraid to customize your FITIV experience! Whether you’re a beginner, working out with modifications, or are a professional-level athlete FITIV can be tailored to suit your goals. How can I start using FITIV Points? FITIV Points are already built into the FITIV app, you don’t need to do anything on your end! Make sure that your FITIV Points tile is visible on your Dashboard and you can start tracking your FITIV Points right away. Check out the detail view of your workout to see its value in FITIV Points. Be sure to also see where you stack up on the Community Leaderboards! For the example above, please provide the resting heart rate and how the max heart rate was calculated.